VietAbroader Business Conference (VABC) is the premier venue for networking, learning and exchanging ideas about doing business in Vietnam between students and business leaders. 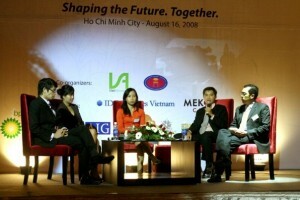 After receiving many positive feedbacks from both our guests and participants in our first conference in 2008, we decided to make VABC an annual event to serve as a connecting bridge between business leaders and college students as well as young professionals to discuss about career possibilities and economic outlooks in Vietnam. In August of 2009, VietAbroader launched its second VABC – Reinvent Yourself in Ho Chi Minh City with the participation of more than 200 college students from both Vietnam and overseas. On August 8th, 2010, VABC was held for the first time in Hanoi, the capital city of Vietnam. 2010 celebrates the 1000 years of establishment of the city, a celebration for the city’s past, and also its future with increasing business opportunities and active economic development. This provided a great foundation for VABC Hanoi as a discussion forum for aspiring and motivated students and young professionals interested in the field of business and entrepreneurship. VABC’s mission is to act as the connecting bridge between our participants and policy makers, accomplished business leaders and distinctive scholars. Thereby, our conference aims to arm our ambitious audience with the necessary knowledge and skills to start a smart career and contribute to the sustained development of Vietnam. VietAbroader Business Conference (VABC) strives to combine a learning experience with outstanding opportunities for networking with top executives, entrepreneurs and business decision-makers from all sectors of industry in Vietnam. Our target participants are young business-minded talents with drive and ambition, as well as business people. The conference focuses on the following six topics: Vietnam and Globalization, Telecoms & IT, Media & Entertainment, Financial Services, Entrepreneurship,Building a Career in Vietnam. Success would never come without a vision. That vision has to start from the very understanding of the dynamic economic and business environment in Vietnam. Only with that knowledge can we effectively respond to the rising opportunities and imposing challenges, especially after the global financial crisis that altered the business landscape for years to come. With the provided insights from renowned scholars and experts, VABC is the perfect opportunity to contemplate the past and envision the future of Vietnam on both a macroscopic and microscopic scale. The Conference is a combination of Presentations, Discussions, and Q&A Sessions. The Conference will start off with Presentation and Discussion about general state of the economy (Panel 1) to establish the groundwork. On that basis, we will introduce growth strategies of the key industries and corporations in Vietnam (Panel 2). Finally, the focus will switch to discussions about prominent career opportunities for those who want to work in a corporate environment (Panel 3), and those who want to jumpstart their own business (Panel 4). In this panel, policy makers and experts will offer diverse perspectives on business and entrepreneurship environment in Vietnam. Presenting the past achievements and addressing the current challenges, we wish to envision the desired changes and future directions for Vietnam. Considering businesses as the key driver of the economy, in this panel, attendees will get to hear success stories and learn about the future strategies of various types of corporations and companies. Believing that anybody can take the lead in the corporate world, we invite human resource specialists and business pioneers to share insights on how to navigate through the complex world of corporate career. Opening a new business can be a risky yet rewarding option for young professionals. In the 4th panel, outstanding entrepreneurs and franchisers will share their start-up tales and offer guidance to our delegates to build their own business.